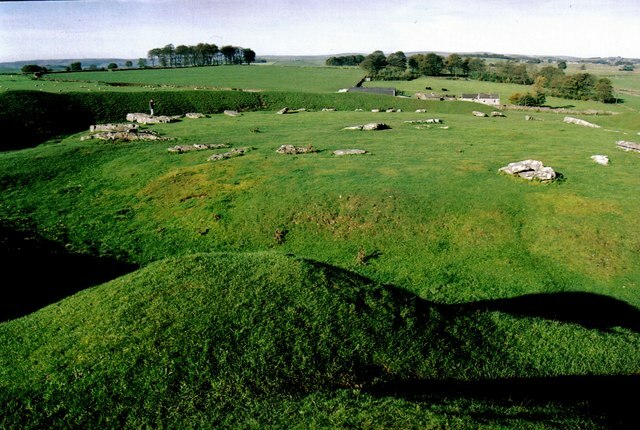 Arbor Low in the Peak District is one of the most important sites in northern England. There is a Roman road nearby, even though we are close to 1200ft above sea level. Surrounded by moorland it gives extensive views. When approached up through a farmyard it looks most unpromising as all the stones are lying down; at first it looks like a very damaged site compared to the grandeur of somewhere like Avebury. There is a large bank and internal ditch and two clear entrances to the circle. Some stones have obviously been removed and one can be seen on the path near to the farm. Location: 3/4 mile east of A515 via unclassified road called The Rake, then after 200 metres right onto unclassified road called Long Rake, and then track to site is via Upper Oldhams Farm entrance on right after 1/2 mile; 2 miles south of Monyash.